Each year, the National Science Foundation (NSF) accepts around 1,500 students to their Graduate Research Fellowship Program (GRFP). These students are in the early stages of their graduate school training in a science, technology, engineering, or mathematics (STEM) field. The fellowship provides a 3-year stipend of $34,000. APS encourages eligible psychological science students to apply for this significant and prestigious early-career honor. Here, we provide a complete overview of the award and how you can apply. When is the NSF GRFP application deadline? Applicants to any field of study must solicit three reference letters, which are due at 5:00 PM ET on November 1, 2019 (2020 Deadline) or October 30, 2020 (2021 Deadline). When are NSF GRFP decisions announced? Applicants receive notification by e-mail in early April. What does the NSF GRFP support? The GRFP supports 3 years of enrollment in a full-time, research-based master’s or doctoral degree program during a 5-year fellowship. For the 2020 award, Fellows receive a stipend of $34,000 and a cost-of-education allowance of $12,000 every year, for a total anticipated funding amount of $138,000. NSF anticipates accepting around 1,500 fellows per year. Fellows who are enrolled in a 2-year master’s degree program can continue the third year of fellowship in a PhD program. Who can apply for the NSF GRFP? Undergraduate seniors and bachelor’s degree holders in the process of applying to a graduate program can apply before enrolling, so long as they are ready to begin their graduate program in the fall after they are awarded the fellowship. Applicants must be accepted into a program by May 1 of the year the award is granted. If they do not receive the award and choose to delay graduate school, they can reapply to the GRFP. If they are offered an award but their plans for graduate school change, they cannot defer the award but can decline before the acceptance deadline without any penalty. Graduate students are limited to one application, submitted either in the first year of graduate school or at the beginning of the second year. NSF encourages women, people of underrepresented minority groups, persons with disabilities, veterans, and undergraduate seniors to apply. What graduate programs are eligible for the NSF GRFP? The GRFP supports students in full-time, research-based, degree-granting graduate programs in the STEM and STEM education fields. NSF does not accept applications regarding practice-oriented professional degrees such as medicine, dentistry, law, and public health. Degree programs focused on clinical practice, counseling, social work, patient-oriented research, epidemiological and medical behavioral studies, outcomes research, and health-services research are not eligible. Eligible areas of psychology include: clinical psychological science, cognitive neuroscience, cognitive psychology, comparative psychology, computational psychology, developmental psychology, industrial/organizational, neuropsychology, perception and psychophysics, personality and individual differences, physiological psychology, psycholinguistics, social/affective neuroscience, quantitative psychology, social psychology, and other fields of psychology. Note that clinical psychological scientists are eligible for the GRFP if the applicant will be doing basic research on a topic that is not described as ineligible by NSF (e.g., only clinical practice, counseling, or social work). What is required for the NSF GRFP application? 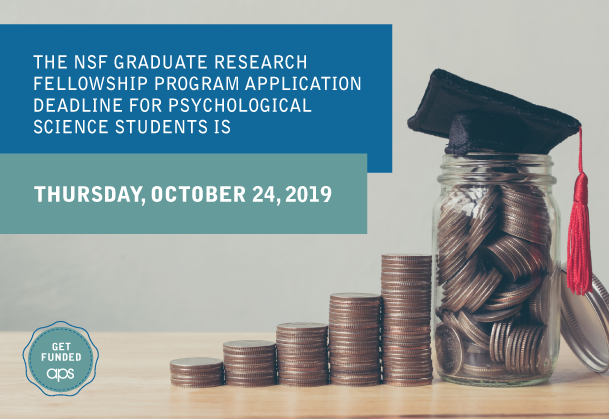 The application includes questions about personal information, education, work and other experience, transcripts, the proposed field(s) of study, and proposed graduate study and graduate school information. Applicants also write a personal statement of relevant background and future goals (three pages) and a graduate-research-plan statement (two pages). Applicants should also provide three reference letters from nonfamily members. Reference letters are limited to two pages each and should address the applicant’s intellectual merit and potential broader impacts on society. For an overview of information on the NSF Graduate Research Fellowship Program, click here. For Frequently Asked Questions about the NSF GRFP, click here. For the full NSF GRFP program solicitation, click here. To visit the NSF GRFP website, click here.